Clearance Under Bed Rails: 8"
Top Height of Mattress Supports: 10.375"
Base of Headboard Panel to Floor: 23.75"
A high quality hand crafted bed can be yours with this Bench*Made Maple Panel Bed or Headboard hand crafted from selectively harvested solid maple. The option of live edge makes your headboard as unique as any Appalachian maple tree. Choose one of 16 finish colors applied with a multi-step process to enhance the natural wood grain. 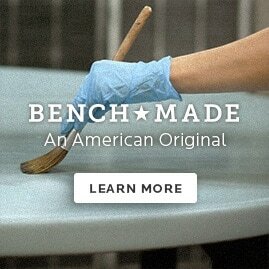 Our artisans craft your custom maple bed just as you need it, in solid wood with your choice of finish. Choose either a solid maple panel headboard or an upholstered insert headboard, with hundreds of leather and fabric options and nail head trim selections (only available in store). And decide whether your bed will feature a headboard with a metal frame, or headboard and footboard combination with side rails and either low or high posts. Available in queen, king, or California king size, with either a clean-lined standard edge or a live edge. With custom Bench*Made Maple beds, the possibilities are endless. The maple hardwood timber used for our Bench*Made collection is carefully harvested in the Appalachian Region of the eastern United States, selected for its natural beauty and wood grain character. Bassett's master craftsmen hand-plane and apply the rich finishes that give these treasures timeless appeal in your home. Bench made (meaning individually created and produced), these pieces are built to stand the test of time and be the centerpiece of your family gatherings for many memorable occasions. Collection includes dining essentials, bedroom collections, and the perfect living room additions. Handcrafted in Virginia. Proud to be American made. Wood, Fabric or Leather Panel.